"...he (casting director LeMaire) said" "You can't have Clifton Webb for this part. He flies." I said: "What do you mean? I didn't even understand what he meant. I already knew that Clifton Webb was a little effeminate, but that didn't bother me at all. I said I would like to make a test with him." 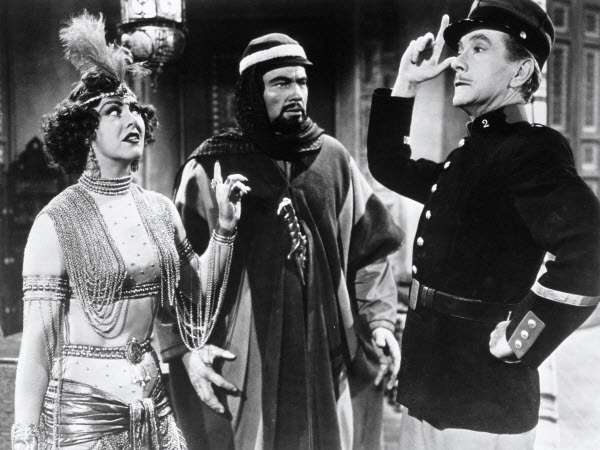 As any movie buff can tell you, the test was made and Clifton Webb, noted stage star with a few silent films under his belt, became at age 45 a most unlikely movie star with a string of hits in the 1940s and 1950s. Popular films include Sitting Pretty which introduced the Mr. Belvedere character and sequels, The Dark Corner, The Razor's Edge, Cheaper by the Dozen, Stars and Stripes Forever as John Philip Sousa and Titanic. 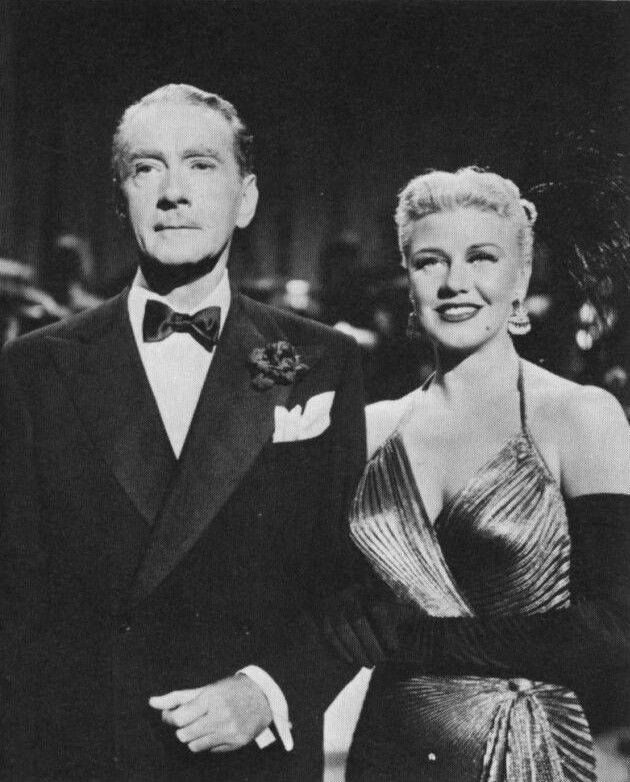 In 1952s Dreamboat Clifton Webb was not only an unlikely movie star, he played an unlikely movie star. Reporter Claude Binyon went from writing about entertainment for Variety to writing for the screen in the 1930s. An ear for a great line and for flawed relateable characters was his hallmark. You have probably enjoyed If I Had a Million, The Princess Comes Across, Sing, You Sinners, Too Many Husbands, and Holiday Inn. Clifton Webb in Dreamboat plays Thornton Sayre, a staid, respected, and often mocked by his students, professor of literature. Some twenty years earlier, the professor went by the name of Bruce Blair and was a silent screen sensation, a "dreamboat". Unbeknownst to the bookish teacher and his equally bookish daughter Carol played by 21-year-old Anne Francis, Bruce Blair has made a comeback. His old co-star "Glorious" Gloria Marlowe played by lovely Ginger Rogers has been hosting their films on television sponsored by a perfume company. They are a hit! The faculty is dismayed. The student body is in stitches. Carol is embarrassed. Professor Sayre heads to NYC to stop this intrusion on his life only to find it is not that easy to stop a money-making venture. In fact, he will have to take the matter to court and even there take matters into his own hands. Fred Clark plays the agent who can't understand his old friend's objections to publicity. Thornton/Bruce finds he still has feelings for his former leading lady and Gloria is one determined gal. 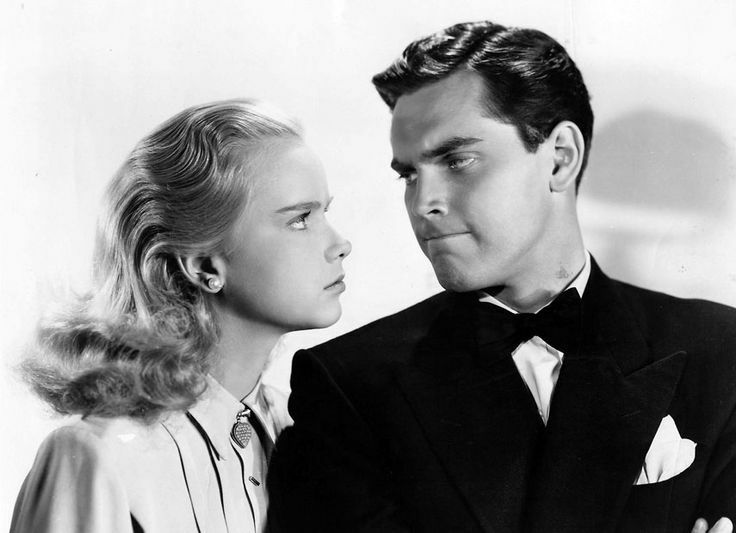 Carol is kept busy by a young executive played by Jeffrey Hunter who opens her eyes to a life outside of academia. The roles for the young people are woefully underwritten, but a pleasant enough showcase for the up and comers. We're really here for Clifton Webb, Ginger Rogers, and Elsa Lanchester. Elsa plays Dr. Mathilda Coffey, the head of the college where Thornton had been so happy for the last twenty years. Dr. Coffey is a confused woman. On one hand, she admires Thornton and wants him to remain at the school. On the other hand, she has long harboured feelings of a most delicate nature toward motion picture star Bruce Blair. Her pursuit of romance is very funny. Also very funny are the glimpses we have of Bruce and Gloria's heyday in bogus clips from their films. The script manages to spoof movies, television, education, movie fans, the law, and love without losing a sweetly good-natured touch. And you have to see Ginger in the Travilla gold dress that will be redone for Marilyn Monroe in Gentlemen Prefer Blondes. Woman's World from 1954 is another Claude Binyon script. It is filled with the characteristic wit that gave the world the headline "Wall Street Lays an Egg" to announce the Great Depression. However, this picture is a glossy soap opera directed by Jean Negulesco (The Best of Everything, Road House, The Mask of Dimitrios). Negulesco and Webb also worked together on Three Coins in a Fountain, Titanic, and Boy on a Dolphin. As Ernest Gifford, Webb is both a character and the narrator of our story of corporate intrigue. Gifford is the largest stakeholder in a family-run motor vehicle company whose top honcho has expired (shades of Executive Suite). The search is on for the right man to fill that top position. Webb as Gifford holds our attention with his biting wit and power. Throughout the trials that follow we also get a sense of the importance of the task. It is not for the wealth alone that proper leadership is required, it is also a question of the Gifford family legacy. The field has been narrowed to three branch managers and they, and their wives, have been summoned to NYC for the once over. We meet these couples and learn about their hopes, ambitions and fears. It is more than a simple question of which of the men is most suitable for the job. Which wife will be the right fit? Arriving from Kansas City are Bill and Katie Baxter played by Cornel Wilde and June Allyson. Bill is bright and independent. The couple is crazy about each other, yet Bill has not let his wife know how much he really wants this opportunity. Katie is very much the homebody. New York is a nice place to visit, but she wouldn't want to live there. She worries about the kids at home. She puts her foot in her mouth at every opportunity. She's a fish out of water and she knows it, but is she as dumb as she lets on? 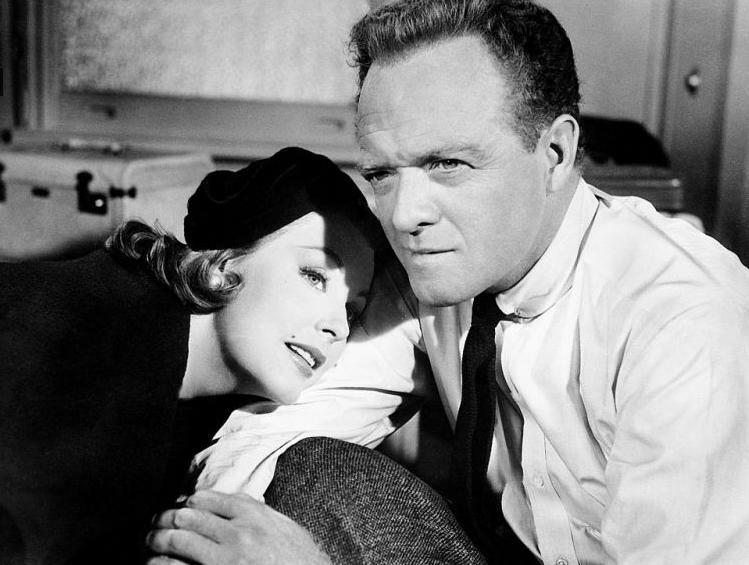 Jerry and Carol Talbot played by Van Heflin and Arlene Dahl have come from Texas where Jerry was recently promoted to district manager. Jerry exhibits a quiet sort of leadership and intensity. Carol knows in her bones that she was born for this, for New York and the pinnacle of society. Jerry plans to get ahead on his own merits. Carol sees herself as the moving force behind the "great man" and will do anything to see that Jerry will get ahead. 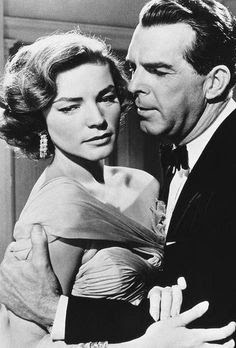 Sid and Elizabeth Burns are played by Fred MacMurray and Lauren Bacall. Sid worked on the factory line when he was a kid and has worked his way up to managing the Pittsburgh branch. He puts everything into the job to the point of neglecting his family and his health, as his ulcer attests. Liz has come with him on this journey for the sake of his career, but in her eyes, their marriage is over and has been for a long time. 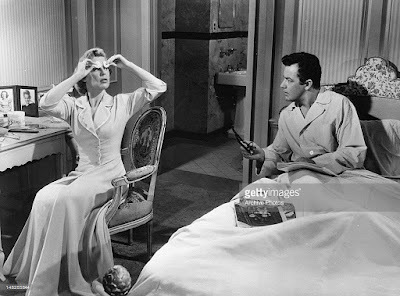 We tour the boardrooms and the bedrooms of these characters navigating the corporate waters and the woman's world - the expectations of 1950s society vs. the personal wants and needs of the wives. Filmed in sumptuous Technicolor and filled with gorgeous haute couture gowns, the movie is a feast for the eyes, a fascinating history lesson and a satisfying melodrama. I'll leave you with the theme song It's a Woman's World by Cyril Mockridge and Sammy Cahn which charted on Billboard for The Four Aces during the autumn of 1954. I enjoyed your write up. I didn't realize that LAURA was Webb's first movie role, but what an interesting screen presence he was! I haven't seen DREAMBOAT but it sounds well worth it. I saw WOMEN'S WORLD recently as I've been exploring Heflin's work. A surprisingly well-done melodrama with a great cast. Have you seen PATTERNS? Some similar themes there but a bit darker. I haven't seen "Patterns" in many years, but it is certainly memorable. I love those "live" days of television with their theatricality and the chance to see great performances from people like Van Heflin. Great write up. I liked both Executive Suite and Woman's World. 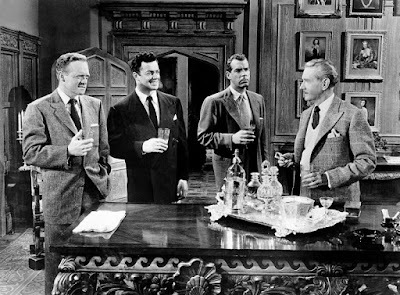 Some of my favorite actors, although I had some trouble at first envisioning Clifton Webb as an Auto exec. But he pulled it off. Its amazing how these 50s movies can pull you in with just well-written drama and good actors. The 50s really was an interesting time. For years, I considered my favourite movies to be from the 40s and while that still holds true, I find more 50s creeping into my heart for a long stay. Clifton Webb was a marvel. Though he'd had plenty of training in his theatre days, imagine become a film star at that stage of his life. He was something special. That wry, knowing delivery, the humor that lifted the sarcasm and made him human, and so interesting on film. His characters were never at a loss for words (well, no "characters" are, but you know what I mean). We all wish we were as quick-witted and, when needed, biting. I think that was a large part of his appeal. PS: Loved your John Philip Sousa piece. While I've seen WOMAN'S WORLD, I'm unfamiliar with DREAMBOAT, which sounds like a lot of fun. Wow, I can't recall seeing Ann Francis looking so young! I think you'd get a kick out of "Dreamboat". Anne Francis shows a lot of poise for such a young lady. Indeed, Clifton is an unlikely movie star - but one I like very much. I especially like him in The Razor's Edge. And, thank to you, I just added Dreamboat to my watchlist. I'm sure you will enjoy "Dreamboat". 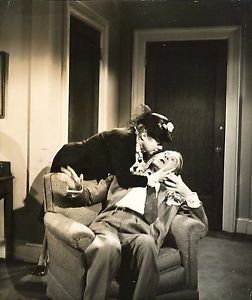 It seems to me that when I was a kid Clifton Webb movies were on TV all the time. That was a very nice time indeed. I know I'll Love Dream Boat. What a terrific premise! I can only imagine how delightful Webb is in this role. Thanks for the recommendation re: Woman's World. I will try to track it down. 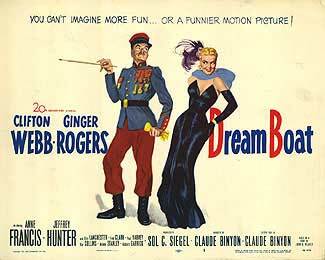 The role in "Dreamboat" seems tailor-made for Clifton Webb and he is a marvel. 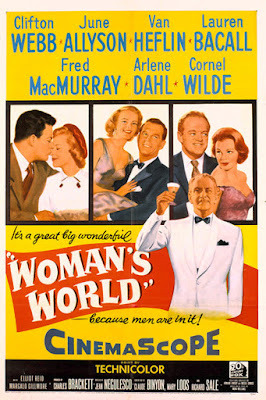 "Woman's World" is the sort of thing they did so well in the 50s and, for me, still entertains.